March products - All Things Special Ed. 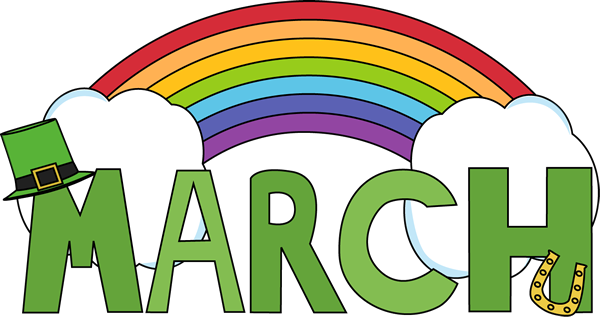 March is here and that means I am switching out some of my monthly products. Each month I have a Math Skills Packet, Noun Sort and Interactive Adaptive books that I rotate out. 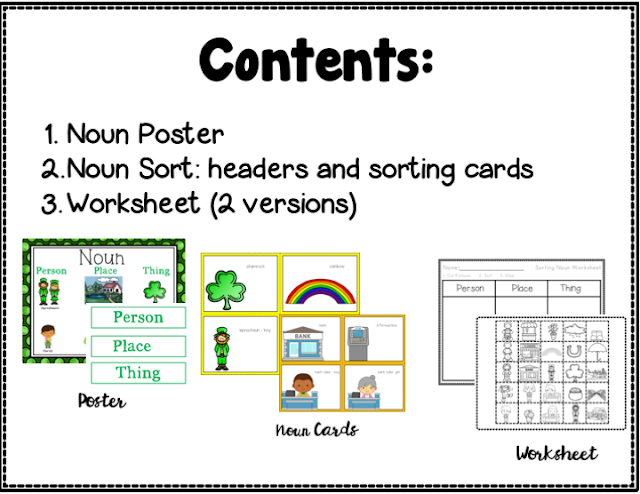 In case you are interested or are on the look out for something new to use in your classroom- check them out below. I know I always love seeing what other people create and use in their rooms! 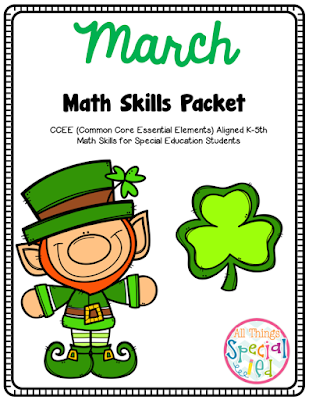 Monthly Math Skills Packet- this product contains over 20 pages of math skills that are aligned with CCEE (common core alternative standards for those with intellectual disabilities, moderate to severe disabilities and Autism) for K-5th grade. 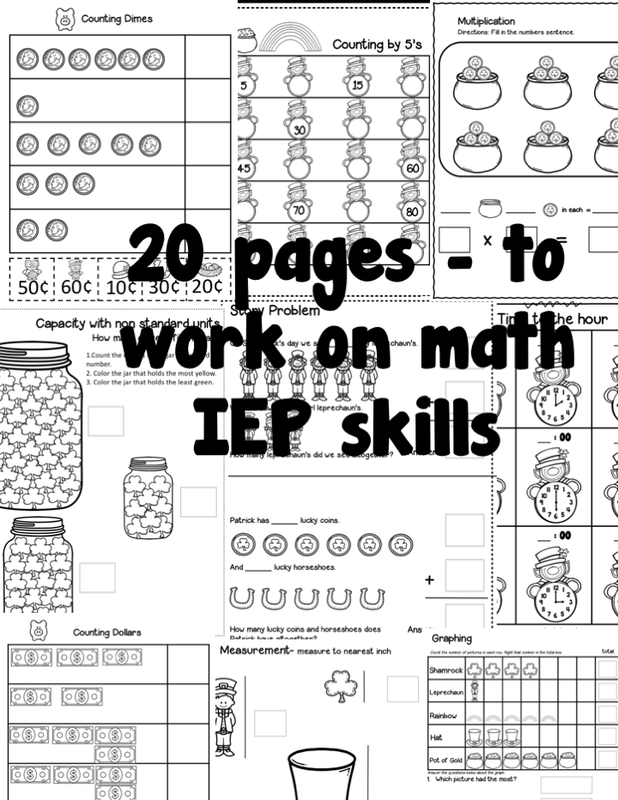 It can be so hard to keep track of all your students IEP goals so I created this packet to keep me accountable and to track student progress with math skills that I don't necessarily teach every week. 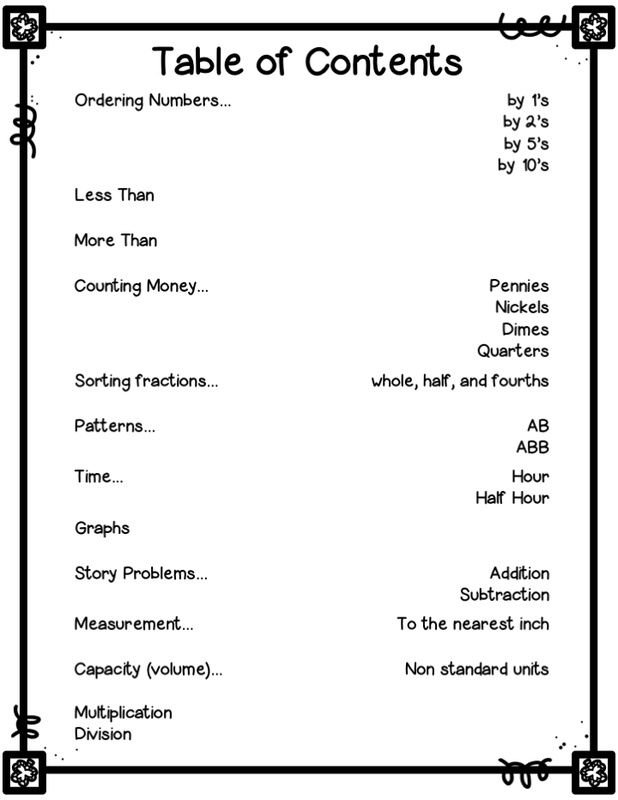 I use a math curriculum called Equals by ablenet inc. (see previous posts if interested) and when we are working on a unit from there, we might not be counting money, working on patterns, graphing ect. so I take time during my 60 minute math block to work on these skills. Some students are independent and some students I work 1-1 with to help with the skills. I keep the sheets and write notes on them so when it comes to progress report or IEP time, I can collect my data and grade appropriately. My students and I work on basic grammar skills through out the year. 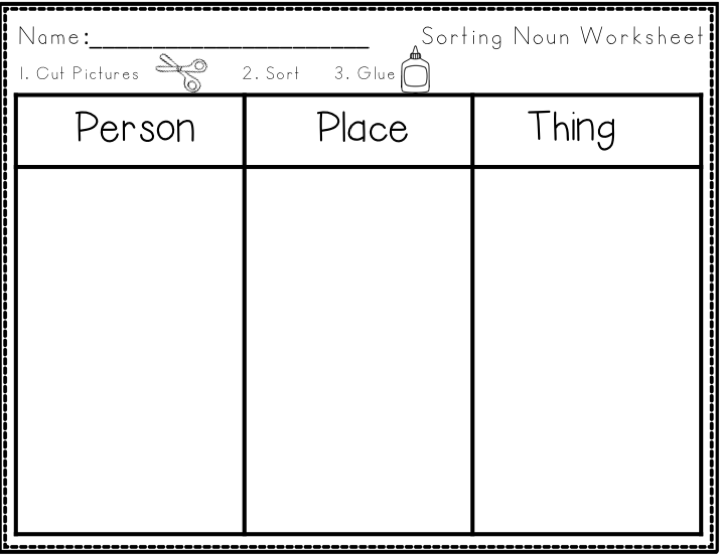 So far I have only created a noun sort but in the future I hope to add in other grammar skills that are appropriate to teach to my students. 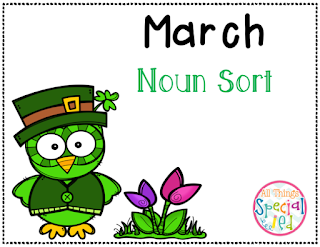 Each month I create a themed noun sort (March I included St. Patrick's day, weather/spring, and a community worker - I like to throw those in to help with vocabulary and knowing community members) that can be used with a pocket chart. You can do this in centers, or large/small groups. Also included in this packet are 2 versions of a worksheet sort. 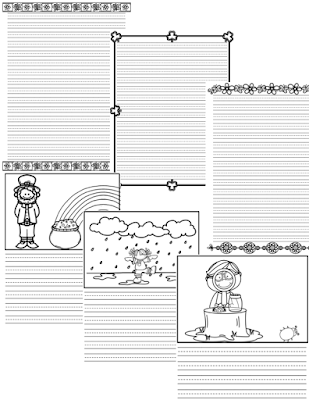 One version is with words, the other version is with pictures. 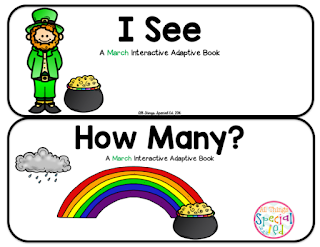 EAch month I do (at least) 2 Interactive Adaptive books to go along with the month. 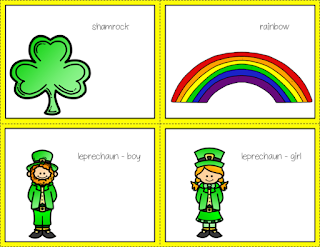 SInce this month is March I incorporated St. Patrick's day throughout this months book series. 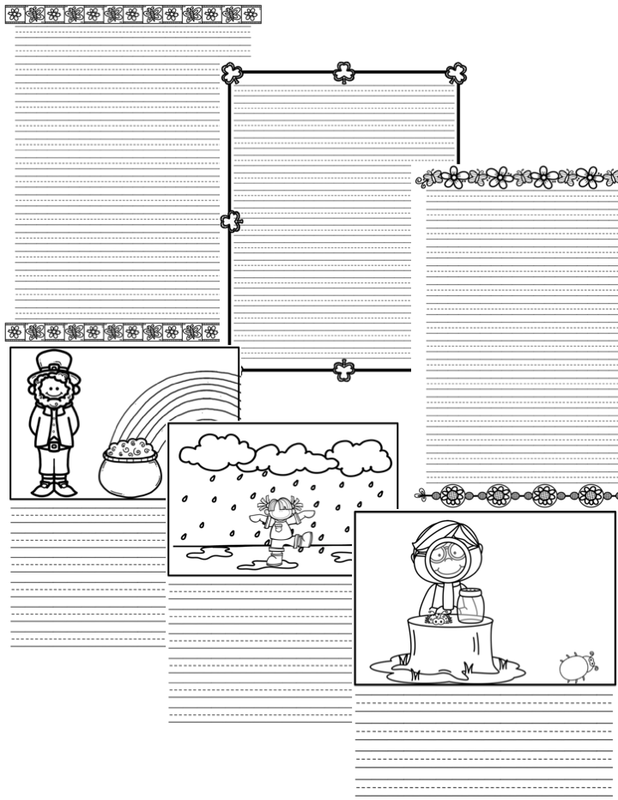 You or the student(s) read the page and then they find the matching velcro tile at the bottom of the page to match the picture on the current page you are reading. Book one is "I See" with March/St. Patrick's day pictures and vocabulary to learn all about things you see on St. Patrick's day. Book two is "How Many?" 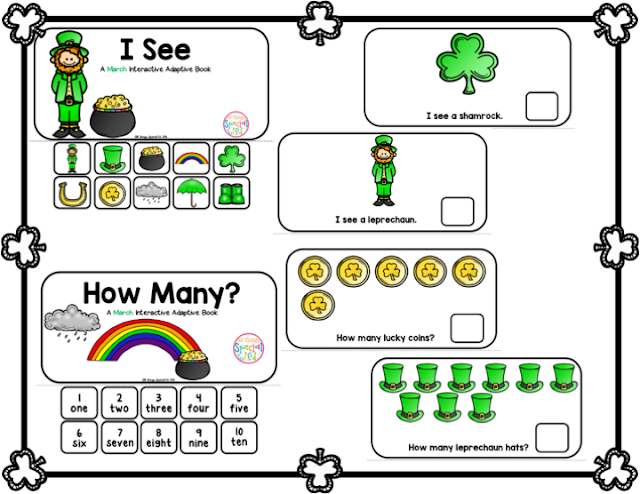 with different St. Patrick's day items to count on each page. 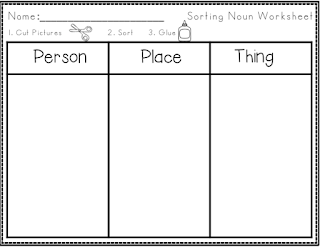 The student counts the pictures then places the number icon on the blank box on that page. This book works on counting from 1 through 10. 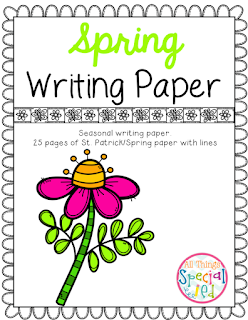 Also you can snag this fun writing paper set for the month of March or throughout Spring! !